Dr. Todd Gladieux has been in practice for over 25 years specializing in the field of spinal bio-mechanics and pain relief. One of our primary goals is to correct misalignment of the spine due to postural changes that were either brought on gradually over time or traumatically induced (i.e. auto accidents and work injuries). At our office we emphasize the importance of structure and function and it's effect on the nervous system. A healthy functioning nervous system means a healthy functioning person, free of pain and disease. We also recognize the importance of good nutrition, exercise, and rest. 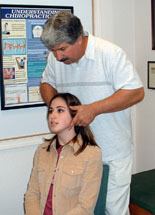 Dr. Gladieux uses several chiropractic adjusting techniques and physiotherapy (when needed). A unique point about the precision procedures used in our office is the program of general and specific corrective exercises which are prescribed to each patient and which will enable the patient to maintain more of a permanency in his or her chiropractic adjustments. This allows the patient to take an active role in their care and to help rehabilitate the surrounding spinal soft tissues. Having the doctor and the patient working together helps establish a more normal mechanical and physiological functioning of the entire spine.